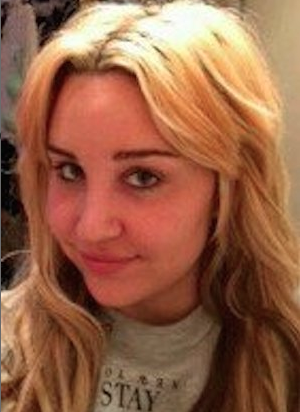 Amanda Bynes lured to California and involuntarily committed to a psychiatric hospital after Tweeting she had been sexually abused by her father for years. Amanda Bynes is reportedly furious with her parents after been 'tricked' into getting committed into psychiatric care. The troubled actress fell for an elaborate ruse set up my her mother, father and Britney's Spears former manager Sam Lufti, to get her on a plane to LA from New York and take her to a Pasadena mental facility. Bynes was committed shortly after she had posted shocking tweets claiming her father physically, sexually and mentally abused her as a child. She soon backtracked on her explosive statements though it is believed Amanda thought she was meeting with a lawyer about suing her parents for abuse. Now her time at the Las Encinas Hospital extended by two weeks,E! News reports. Amanda was taken to the hospital on Friday after she arrived at The London Hotel in Los Angeles, to find both her parents and her lawyer waiting for her. Once taken to the hospital, Amanda was reportedly put under a 5150 psychiatric hold for 72 hours, and now it will be extended for a further 14 days. The news comes after People reported that her parents Ricky and Lynne Bynes are said to be happy she is now in the care of medical professionals. A source told the publication: 'They're happy she's safe and that Amanda is finally getting some help.' She was committed to a psychiatric hospital on Friday night after flying in to LAX following her continuing battle with mental health issues. i think she was telling the truth. her parents seem eager to try to cover up all this. and that britney's former manager was involved makes even more sketchy to me! i think that 'mental facility' is really a reprogramming center! but amanda isn't falling under the mind control tricks anymore! How can you think she's telling the truth when she took it all back saying she only accused him of abuse because the microchip he put in her brain made her say it? That's not common behaviour for abuse victims, but it is common amongst schizophrenics. Mind Control victims usually speak in this manner when they start resisting and rebelling against control mechanisms. Keep in mind this young lady was lucid a few years ago. The same breakdown occurred with Britney Spears. Britneys dead eyes tell a story. It's possible she is being forced to do that show in Vegas. She complies to make sure her children are safe. Something is seriously going on in the Disney and Nichelodeon systems. They are sexualizing children at an early age. The age of denial is over.